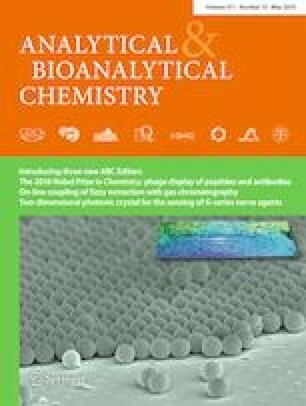 The present work is aimed to develop a simple, rapid, and cost-effective CE method for the determination of trimethylamine (TMA) from bacterial origin. Optimum separation of TMA from the other components of the bacterial culture was achieved using a fused silica capillary (27 cm × 75 μm ID) and a background electrolyte solution that consisted of 0.75 M formic acid at pH 2.05. Analytical characteristics of the proposed method were evaluated through the study of its specificity, linearity, precision, accuracy, robustness, and detection/quantitation limit values. The method was linear over the range 25–2000 μM (R2 = 0.9998). The LOD and LOQ were 9 μM and 27 μM, respectively. Intra-day and inter-day RSD were ≤ 0.24% and ≤ 1.3% for migration time, respectively. Intra-day and inter-day RSD for peak area were ≤ 2.44% and ≤ 3.51%, respectively. The method showed a good accuracy with recovery percentages ranging from 95.45 to 102.21%. The method was successfully applied for the determination of microbial conversion of l-carnitine to TMA. The method shows great potential in high-throughput screening applications to assess the functionality of the gut microbiota to produce TMA. The online version of this article ( https://doi.org/10.1007/s00216-019-01716-2) contains supplementary material, which is available to authorized users. The authors wish to thank Prof. Jonas Bergquist from Uppsala University for the donation of the P/ACE 5010 capillary electrophoresis system and Dr. Alberto Valdés for his support during the donation of the equipment. The authors also thank Prof. Rosario Muñoz (ICTAN-CSIC) and Dr. Héctor Rodríguez (CIC bioGUNE) for their kind donation of bacteria strains. This work was funded by the Spanish Ministry of Science, Innovation and Universities (project AGL2017-89055-R). The ethical standards of the respective institutions as directed by the institutional biosafety and ethical committees have been adhered to.